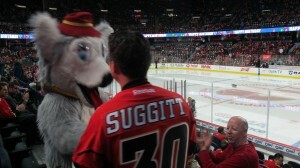 I was joined for this game by a good friend (Barry Powis), who is a lifelong Calgary Flames fan! 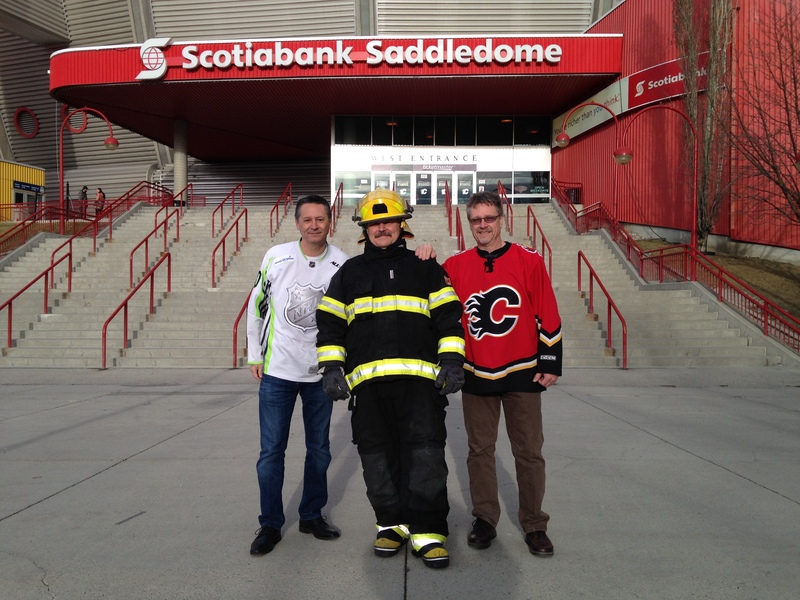 We had our picture taken with a firefighter outside the arena, and I quipped that he may be needed if the Flames get too hot! 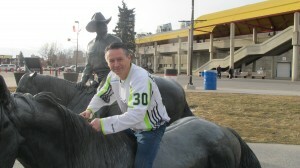 I also happened upon a horse outside the Saddledome, near the Stampede grounds. 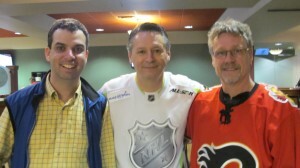 I met up with a writer/correspondent for a hockey magazine I publish in Calgary: Jeremy Freeborn. He helped line up a few of the interviews which took place that night. 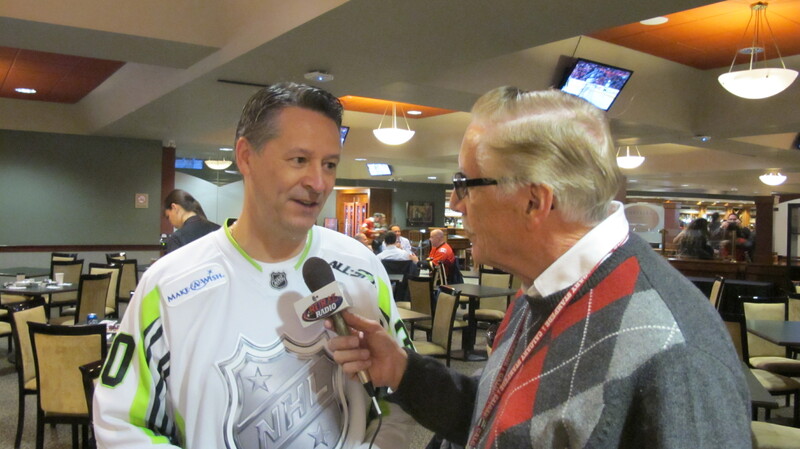 Similar to the recent games in Edmonton and Vancouver, there were a number of media requests to talk about the 30games-30nights hockey trip, and also, the charitable component: Make-A-Wish. 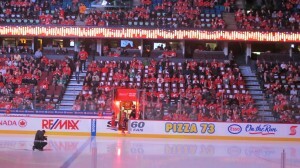 When you settle into your seats in the Calgary Saddledome, you know you are in a hockey town, and in hockey town thick in the playoff race. There are more home town jerseys in this arena (and by far) compared to any of the arenas I’ve been to so far in my journey. But as with every rink attended so far, there are always a few out-of-town fans, and in this case, I would estimate approximately 300-400 Dallas fans. 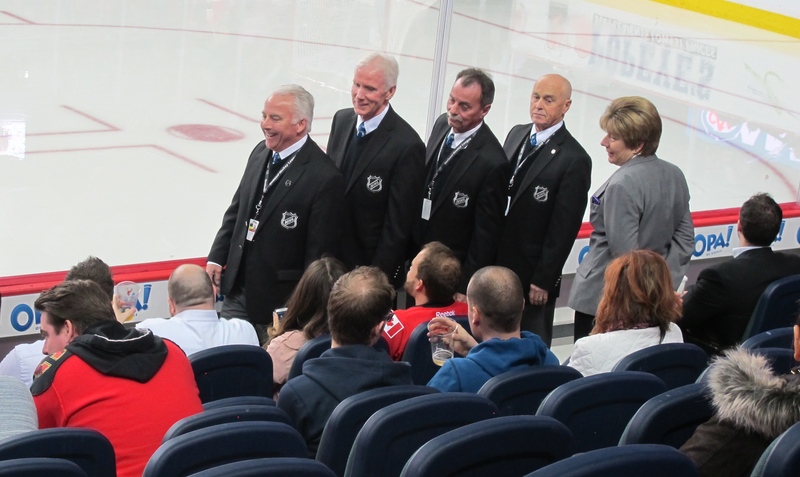 You could hear the Stars fans when the U.S. anthem was sung, when they chanted “Stars” when the word stars was sung. 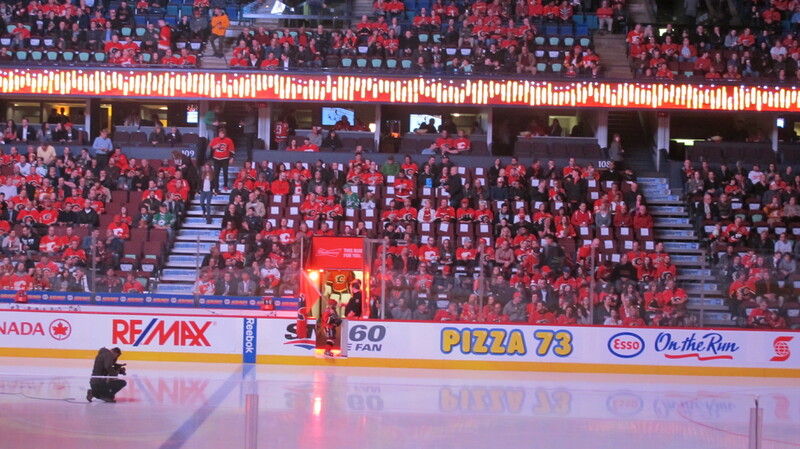 The Flames fans brought the decibel level up significantly, when the words “sea” (“C”) and “red” were sung. 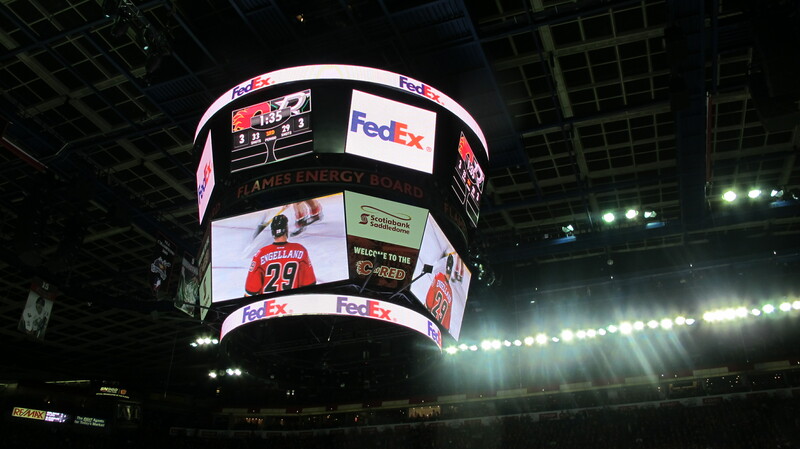 As for building noise (and despite hearing otherwise from a few Flames fans before the game), this was one of the loudest buildings I’ve been in so far, in particular when the local team scored a goal. 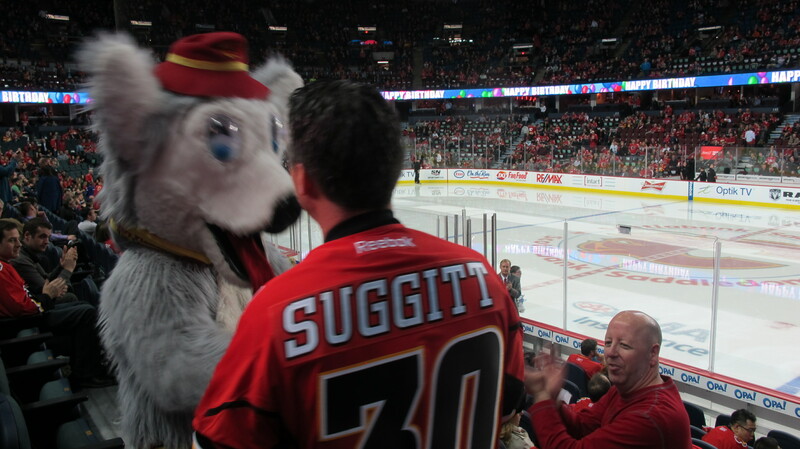 In the second intermission, I was surprised with a visit by Harvey the Hound, who presented me with a very special jersey commemorating my 30 day/30 game trip! 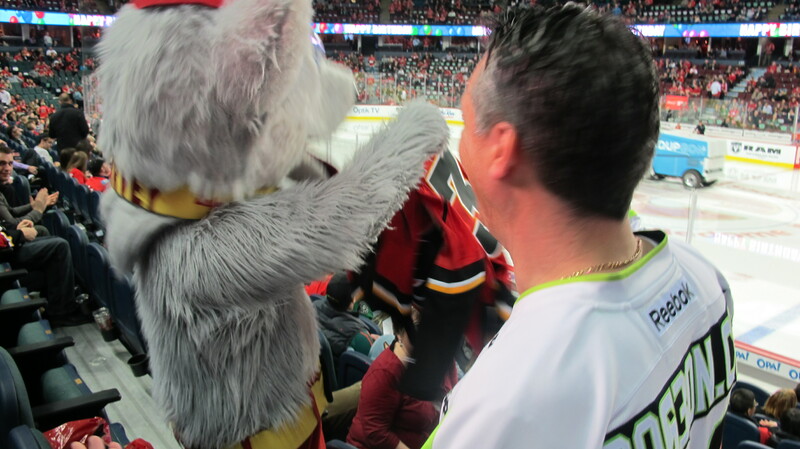 So for one hockey game period, my custom “30games-30nights” jersey was covered up, but it was hard not to be a Flames fan this night. 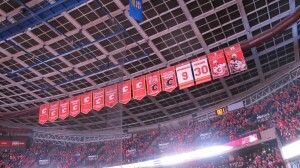 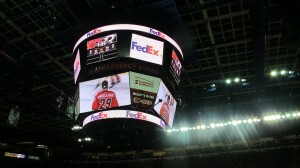 It was a very classy for the Flames to do this! 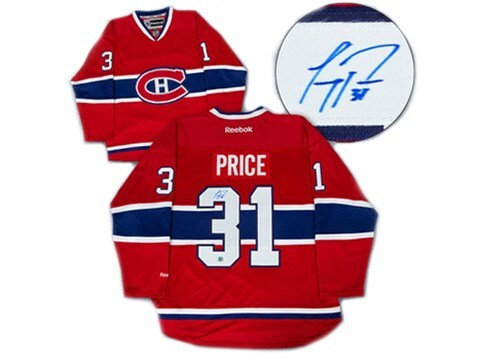 I will be pulling for the Flames to make the playoffs!